A six-story, 193,000-square-foot, brick-masonry structure – Fortress – is one of Milwaukee’s most recognizable historic buildings. Originally built in 1892, Fortress has seen several additions in the years leading up to 1912. The result is a distinct, red brick building with unique architectural flourishes and a tower feature that’s reminiscent of a medieval fortress. The building’s original tenant was the F. Mayer Boot and Shoe Company, which at its peak produced over 9,000 shoes per day. F. Mayer Boot and Shoe Company was well known for it’s “Milwaukee oil grain goods,” said to be unrivaled for comfort, wearing quality, and ability to keep out wetness. Given Milwaukee’s proximity to fresh water, port access, and large volumes of livestock, it became one of the largest tanning producers in the world; access to these resources enabled the business to grow rapidly and the company’s complex grew to an entire city block. 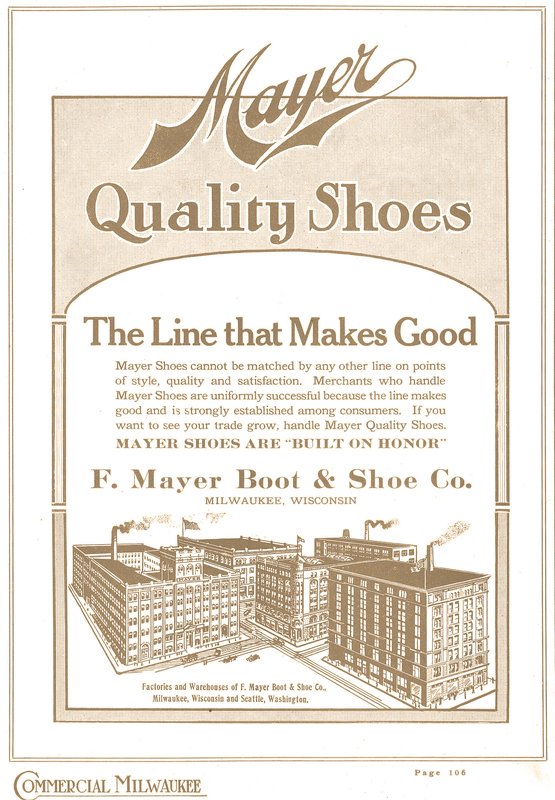 “The F. Mayer Boot and Shoe Company represents one facet of the giant tanning industry which made Milwaukee a leader in the country,” notes the Wisconsin Historical Society. While Frederick Mayer passed in 1897, his three sons continued to run the business. By 1910, the company had expanded operations to include a five-story building in Seattle to meet the demand along the West Coast and Alaska. The business continued to operate out of Milwaukee until 1934 and remained in use for shoe manufacturing until 1938. Since that time many other firms have occupied it, from musicians to artists and even a daycare and Montessori school. Frederick Mayer makes the move from Darmstadt, Germany, to Milwaukee, Wisconsin, and opens a shoe store on Water Street. Frederick’s shoe store is thriving, and he decides to go into the shoemaking business. He opens a two-story building on the northeast corner of 1st and Walnut Streets. Business is booming for Frederick Mayer and sons. Architect Herman P. Schnetzky is hired to expand the current building upward and to the east, resulting in a five-story structure. F. Mayer Boot and Shoe Company continues to thrive. 125 employees are making approximately 150 pairs of shoes per day. The first expansion allows for production to increase to approximately 3,000 pairs per day. Mayer passes in 1897. His three sons continue to run the business. Mayer hires architect Eugene Liebert to expand the building to the east. Additions were made to the northern quadrant of the building in 1900, 1906, and 1912, resulting in the variety of connected structures that we today know as the Fortress. The company is at peak production of 9,000 pairs of shoes a day. F. Mayer Boot and Shoe Company ceases operations. However, the building remains in use for shoe manufacturing. One of Milwaukee’s most prominent buildings is undergoing a major restoration. Historic apartments, retail and office space with a wide array of amenities to match a multitude of interests coming January 2019. Subscribe to our newsletter for availability updates.